Home Food Chinatown’s Lasa is Redefining Filipino Cuisine in L.A. If you’ve followed the city’s wave of new Filipino restaurants over the past year or two, there’s a fair chance you’ve heard of Chase and Chad Valencia. The brothers have been slowly garnering acclaim for Lasa, their roving Pinoy-Californian concept (the name means “taste” in Tagalog), which last year landed at Unit 120, Eggslut founder Alvin Cailin’s incubator space inside Chinatown’s Far East Plaza. This past April their erstwhile pop-up became a fully realized restaurant after Cailin handed over the keys to the Valencias. The duo seems to have settled into a killer groove. On most nights the dining room vibrates with the loose energy of a house party, its walls covered in family portraits and passed-down trinkets. A large sofa near the door functions as a place to linger over adobo-style peanuts lashed with black vinegar. Servers are genuinely excited to explain the nuances of bagoong, the umami-bomb shrimp paste that adds depth to wok-seared Chinese broccoli, or to extol the puckering charm of house-made green mango soda. Chad, who runs the kitchen, spent time at farm-to-table heavyweights like Sqirl and Canelé, so it’s unsurprising that his cooking exudes both the sharp, resonant flavors of traditional Filipino cooking and the produce-driven aesthetic of California—Alice Waters filtered through Manila. A brilliant riff on panzanella salad weds summer tomatoes and toasted bread with a salted duck egg aioli; beef tartare kilawin gains a salty punch from patis, the rustic Filipino fish sauce, while the comforting porridge known as arroz caldo—made with long-stewed brown rice—is enhanced by roasted trumpet mushrooms instead of chicken. Savoring the last spoonful from a ceramic bowl filled with ginataan, an ambrosial coconut-tapioca mousse crowned with sliced mandarinquats, yields a sweet conclusion: No kitchen has captured the lightning-rod excitement of Filipino cooking quite like this upstart. 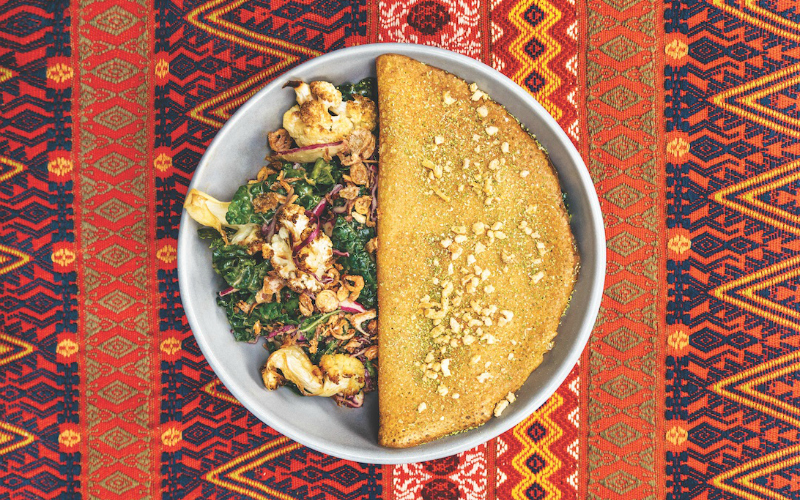 The arty crowds spilling onto the sidewalk are in line for Conor Shemtov’s plucky Israeli cooking at Mh Zh (pronounced “MAH-zeh”), a minuscule corner space where milk crates double as furniture. Soulful plates are worth the quirks: Lamb ragù with pickled beet stems sits atop lush tahini, while roasted potatoes require only a squeeze of charred lemon to shine. Iconic New York restaurateur Jean-Georges Vongerichten has expanded his empire, debuting a palatial branch inside the new Waldorf-Astoria hotel. Soaring ceilings and white leather booths over more excitement than the menu: Black cod arrives expertly poached, but its curry sauce tastes like creamer. Better to splurge on opulent bites such as egg with caviar. Zack Pollack amassed a following for revisionist Italian at Alimento, but at his new modern pizzeria the spotlight is on indulgent Italian American fare like smoked mozzarella sticks and oozy eggplant parm. Don’t miss the Hawaiiana pizza—it’s what happens when a Neapolitan purist cuts loose.